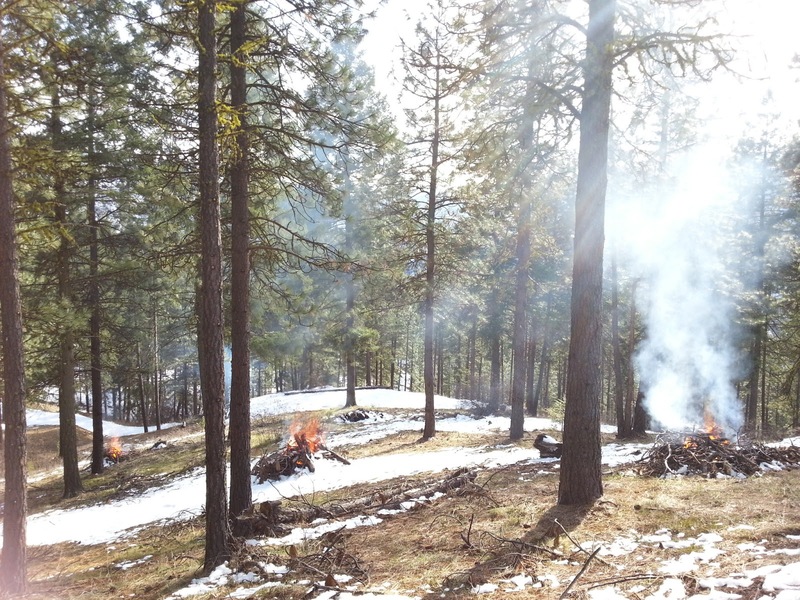 Each season starts with burning off last season's slash. This was an easy year. We did a lot of thinning last summer, which created some sizable piles of limbs and tops. But when we pruned those work acres we scattered the limbs instead of piling them. That kept the workload manageable this spring when it came time to burn piles. In past years we've burned as many as a hundred piles. 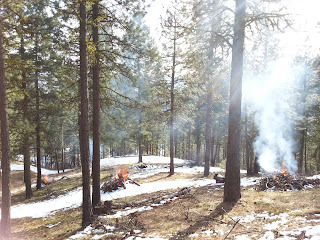 Setting aside the work of plowing a mile of road to get there, burning is hard work. Most piles are not where you can drive to them, so the torch must be carried up the hills in mud and snow. The propane tank and flame thrower weigh 30 pounds or so. It's not all that warm out yet -- if we're lucky we get a dry day with some sun breaks. But if we wait into May the fires are too difficult to manage. Once a pile gets going and throws off some heat so we can warm up, we have to move on to start another pile. And it's smoky. The strategy we use is to walk downwind to light the first piles, and work our way upwind. Then we don't get smoked out by the earliest fires we ignite. Early morning is the best time to light piles because the wind is calm. However the wind also shifts at that time of day. The easiest and warmest part of the job is circling back around to the piles and pushing in the "bones." A pile burns from the middle out, and gets less intense as the fuel gets thinner at the edges. The result is a ring of charred but unburned wood around a bed of hot ash and coals. 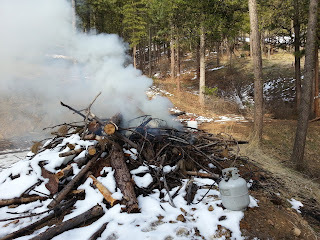 We light fires for a couple of hours, then go back, starting with the first ones, and use a fire rake to push those unburned sticks into the fires. In one area of the work area we're saving some piles of slash to use in the construction of a wildlife pile. 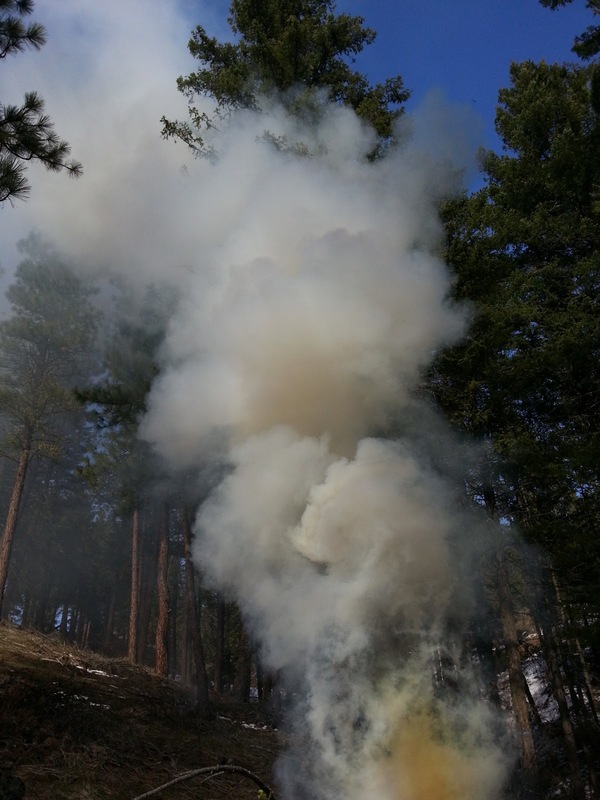 Otherwise our NRCS EQIP grant terms require that we remove the slash, and burning it is the most practical method. (DNR FLEP also strictly requires it.) Chipping or hauling requires being able to drive up to the pile with a piece of equipment. That's rarely possible.